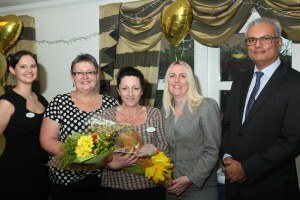 The Heart of Gold Awards, which were launched by Carebase in 2009, seek to thank and recognise employees for their dedication and commitment in providing high quality care and compassion to all the home’s residents. Employees can be nominated by residents, relatives, co-workers and social workers, and anyone who works in the home care can be nominated. Each of the eleven care homes and the two specialist acquired brain injury units were visited by Carebase Directors and the Chairman to present one special person with the Heart of Gold Award. All of the recipients of the award were given a beautiful glass plaque and the ladies received a Tiffany necklace and the gentlemen an Armani watch. This year’s worthy winners will now become Heart of Gold ambassadors and will inspire colleagues to promote the highest levels of care and commitment to the residents and their homes.